The Filipina Women’s Network (FWN), represented by Dolly Pangan-Specht (2009 FWN100 US) and Maria Beebe (2011 FWN100 US and 2013 FWN100 Global, board member, and book co-editor) organized a book reading in collaboration with Portland State University’s Office of Global Diversity and Inclusion, Department of Anthropology, and Center for Women and Leadership. 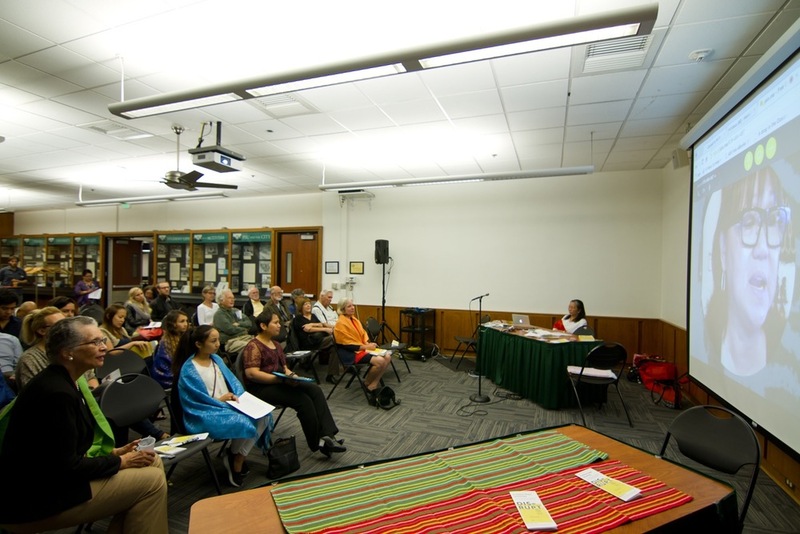 The Asian Pacific American network of Oregon (APANO) and the Council of Filipino American Associations (CFAA) also participated. Global Networks, Janet Labar, and Cynthia Reidy donated books as gifts to the readers. Tambayan and Columbia Distributing provided food and drinks. Marily Mondejar, FWN founder and CEO, joined the participants via https://www.join.me/ to share the three events that shaped the direction of the Filipina Women’s Network. Dolly Pangan Specht -- Writing for Sainthood by Janet Susan R. Nepales ; LaVerne B. Brown -- Blackapina by Janet C.Mendoza Stickmon ; Welo Rivera Cao -- Ad Astra per Aspira: To the Stars through Difficulties by Penelope V. Flores ; Rae Santos -- A Filipina in a Word, a Filipina in the World by Astrid S. Tuminez ; Sunny Petit -- We Speak their Names by Annalisa Vicente Enrile; Shannon Aniciete -- A Guided Path: My Career in Medicine, Research and Public Service by Carmencita M. David-Padilla, M.D. ; Nim Xuto -- Beating the Odds by Shirley S. Raguindin ; and Malia Gayomali, Elissa Santos, and Maili Smith -- Letter to a Young Filipina by Lirio Sobrevinas Covey. Following the example of the Las Vegas reading, lead by Gloria Caoile, we invited young girls to read a Letter to a Young Filipina by Lirio Sobrevinas-Covey. The three young girls are Malia Gayomali (age 13), Elissa Santos (age 12), and Maili Smith (age 14). Lirio emailed back: Congratulations and thank you for taking part in this forum on Filipina Women global leaders. I wrote my letter with young girls and women like you in mind. I hope the diverse experiences and sentiments I described will be helpful as you develop your precious person-hood. Astrid Tuminez whose chapter was read by Rae Santos and who was in Barcelona took time to send this message: I believe that our stories of life, living, and transcending are super important to share. We do not always know where our paths will lead, but we know that we can always DREAM, work hard, have faith, help others (and accept help in return), and define the mark we want to leave in this world. Dolly and Maria have met their objective of introducing the book to a diverse audience, not just to Filipinas but to a broader “sisterhood” in Portland. Their challenge to the readers and other participants is to continue sharing the stories through similar readings and other book events.